Happy Monday! Every Monday I'm sharing a reading for the week to see what energy is at play and how we can work with it, along with some extra added guidance at the end of the post. I hope you enjoy these weekly readings as much as I do! This week I'm pulling a cards from the Oliver Hibert Tarot and Strange Lands Oracle. Let's see what's brewing this week! I love the energy playing between these cards! We're starting with the 4 of Cups and easing into the 7 of Coins. My first thoughts when I saw these two was visualization and patience. With the 4 of Cups, normally it comes off as a card of boredom or disinterest, but in reality you may just have something else in mind. In this deck, I get a real strong pull of keeping your goal in focus. You might be presented with some options this week, but you know they aren't what you truly really want because chances are there's something you have your eye on. Keep whatever it is you want front and center! By keeping our focus on what we truly want, it'll help us bring it into fruition that much easier... now, it doesn't mean it'll be handed to you on a golden pillow. There's still work to be done! ... here's where the the 7 of Coins comes into play. If you want something bad enough, you need to work for it and put in the time. I always call this card the "gardener" and it's a card of both work and patience. Nurturing is key this week and what's better, we have a New Moon showing up at the end of the week! 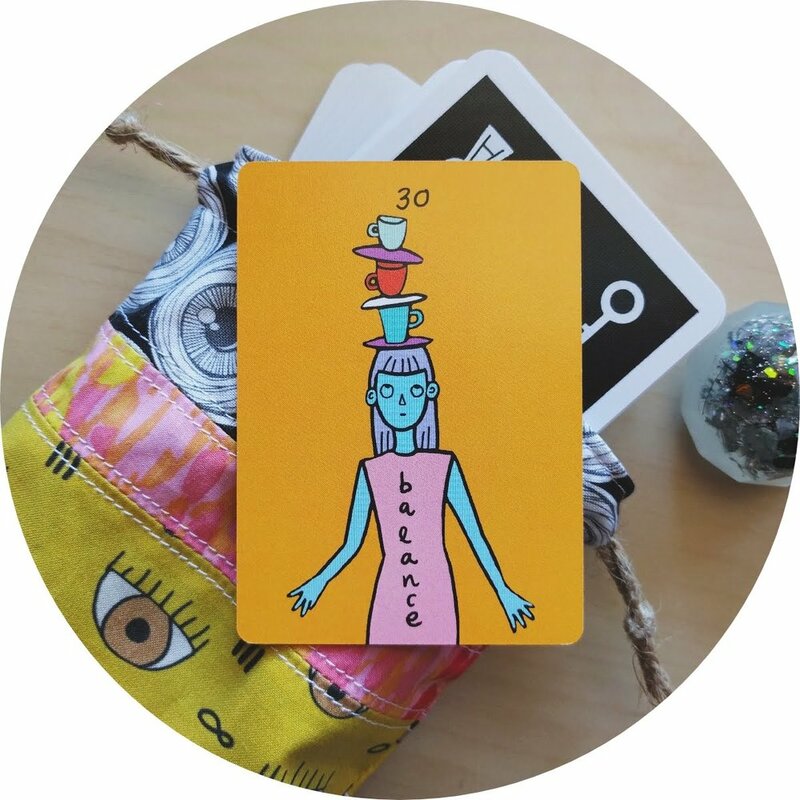 This is a perfect chance to really sharpen your intentions and note what steps or actions need to be taken in order to reach that cup hanging in the 4 of Cups. One thing I'll note is that you need to be realistic here! Keep your goals reachable and doable, break them down into baby steps if you need to but just don't give up. A final note I wanted to add! There are a few patterns in these cards but the one that stood out to me the most were those palm trees in the first card and the single palm tree in the second. This tells me that we may be torn between two options and need to bring our focus to just one, for now. It's hard to juggle multiple things at once, but if we just bring our attention to one thing at a time we can really give our full heart and time into it to give it the best possible chance it has with getting off the ground. Lately, my favorite oracle deck has been the Visions: Crystal Oracle! It seems every card I pull really resonates with the tarot cards I draw, this deck is magic! I pulled Rose Quartz for our extra guidance and most may know this stone pretty well, it's known as the stone for the heart. When working with our goals it's a great idea to bring your heart into this! Rose Quartz lets us know that you need to be patient with where you are right now, you are doing just fine. You need to be a little kind to YOU! A lot of times people are kind to others but they forget to be kind to themselves. This is your friendly reminder to take care of yourself! What do you have going on this week? Let me know in the comments! Happy Monday - a fresh new week has begun! Every Monday I'll be sharing a reading for the week ahead to see what energy is at play and how we can work with it, along with some extra added guidance. I hope you enjoy these weekly readings as much as I do! I'm slowly making a new home on this blog and I have to say, I'm excited for this change! This week I'm pulling a cards from the Spirit Speak Tarot and Visions Crystal Oracle - I'll be reviewing the Visions Crystal Oracle deck soon, along with several other decks! The energy this week is coming from the 8 of Wands, some much needed movement if you have been waiting for the wind to pick up! The 8 of Wands is all about direct action and getting your feet off the ground - go, go, go! Now, this isn't a gentle blow of the wind I'm talking about, this is a full force blast of creativity pushing us in the direction we need to be moving in. This shift is headed into a clear focus as we move towards Judgement, a card that always tells me to wake the f#%k up and open your eyes! I love how the 8 of Wands boat is moving directly towards a new calling to join others with their hands up, waiting to be chosen. Tag, you're it! It's time for you to breath new life into your lungs and see what you are truly capable of. Listen to what you are yearning for and begin to take the steps you need in order to get where you need to go - then go full force! Always state your intentions loud and clear - announcing them to the world is optional, but it's great for accountability! I pulled a card from the Visions Crystal Oracle for some extra added guidance this week. Tiger's Eye is a stone that asks you to seek towards more clarity in any movement you decide to go in (great for our cards this week). It also urges you to seek out to others if you are feeling quite anxious and vulnerable, you don't have to be alone in this. If taking a new leap is making you nervous, it's perfectly normal. There's a quote I love that reminds me of just this: "a goal should scare you a little and excite you a lot". This rings so true! While it can be hard to open up to others when you're in this state, it's a good idea to do so. Connecting with others will only help us move through these emotions easier knowing someone else can relate to what you are going through and give you some much needed advice.